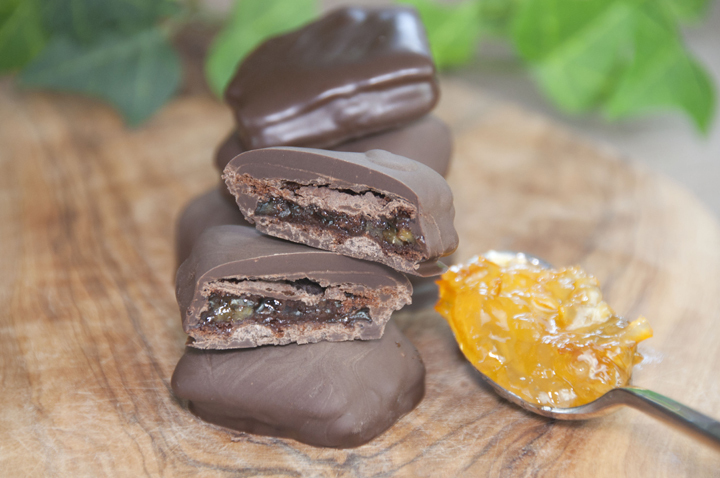 A recipe for rich chocolate petits fours with Brownie Brittle and orange marmalade filling which will satisfy even the most discerning chocolate lover. This recipe opened up a whole new world for me. I’ve been wanted to expand my horizons when it comes to baking and really wanted to try something I’ve never done before. Enter these Petits Fours made with Brownie Brittle! I did some research to see what exactly a Petit Four was and how they were made and proceeded to come up with a fun, original recipe for you guys. This has honestly been one of my favorite desserts I have made in a while. The flavors of the chocolate and orange together were just perfect. I even had a bunch of taste-testers over my house last weekend to try them out and they wholeheartedly agreed that these were amazing! What is this Brownie Brittle that I speak of? If you don’t already know, it’s time you found out. I was introduced to this wonderfully addictive product while at a food blogger conference in Miami back in May. 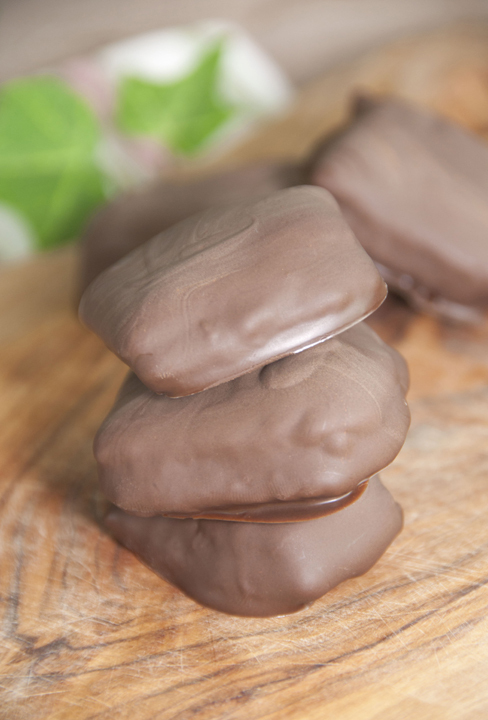 They are light, crunchy brownie snacks that taste like crispy brownie cookies! You get that rich brownie taste without having to bake. Just pour yourself a tall glass of milk and you’re good to go! I made these Brownie Brittle Chocolate Peanut Butter Parfaits a while back that were to die for! Make sure you check them out. In case you are as much in the dark as I was prior to making these, Petits Fours are essentially miniature cakes or desserts, and they can be made with a wide variety of flavors and decorations. Petits fours are so simple to make and can be made into countless flavors with various fillings. The orange liqueur filling sandwiched in between two pieces of Brownie Brittle really puts these over the top. Orange liqueur is simply a sweetened alcoholic beverage with orange flavoring and is easy to find at the store. You can always leave this out and just use the orange marmalade as the only element of the filling. I highly recommend using the orange liqueur for that extra flavor if you can get your hands on it. Enjoy! A recipe for rich chocolate petit fours with Brownie Brittle and orange marmalade filling which will satisfy even the most discerning chocolate lover. In a separate bowl, stir together the marmalade and orange liqueur. 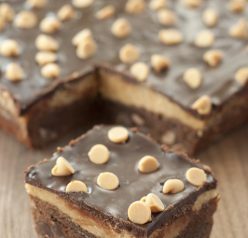 Pair Brownie Brittle squares that are similar in size. On the flat side of one square, spread ¼ teaspoon of the orange marmalade filling and place flat side of the 2nd Brownie Brittle square on top (the marmalade will be sandwiched in the middle). Repeat process until you have used all squares. Melt chocolate using a double broiler or microwave. Dip squares into the bowl of melted dark chocolate using a fork and let excess chocolate drip off. Place on a piece of waxed paper to set for a half hour or until chocolate is hardened. Repeat process until all are coated. You should have approximately 24 sets of squares. You will have chocolate leftover but it makes it easier to thoroughly coat your Petit Fours by having extra in the bowl. Disclaimer: This post is sponsored by Brownie Brittle, but all opinions remain 100% my own. 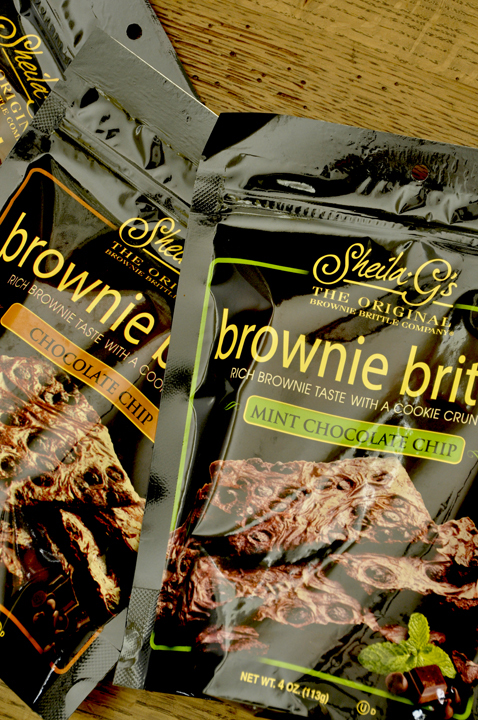 That Brownie Brittle is so addictive! The petit fours look absolutely delicious! I want one! You couldn’t be more right! Lol! How cute and unique idea. I bet the brownie brittle gives this a great texture. Thank you so much, Melissa! It really does. Orange and chocolate is such a classic combination. These look wonderful! I agree! I’m sold on it! I LOVE brownie brittle. I love that you took it and made it into something even more amazing! I love the idea of these, chocolate and orange go so well together. Looks great. I will definitely check these out. Wow this looks super yummy! 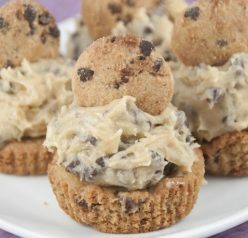 I will definitely have to make these! I love chocolate and marmalade so the combo should be delicious. Gah! I love the orange marmalade in these. I adore orange marmalade and I haven’t had it in so long – thanks for the reminder! And, the great recipe! I have yet to make petit fours and try brownie brittle! Looks like I need to try these ASAP and cross off two items on my list! Yes, Eva!! 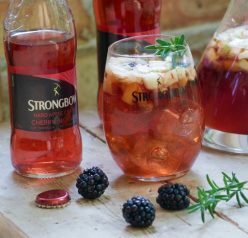 It’s worth the try – so good! Stop it! These are waaay to easy to make (and eat!) I love all the chocolate in here and the crunch the brownie brittle gives. Yum! This is such a clever use for Brownie Brittle! You could give these as gifts, and folks would think you bought them at a fancy candy store. Great recipe, Ashley! You did a great job, they look awesome! I’ve always enjoyed the combination of orange and chocolate. These sound just delicious. I am sold on that combination! Thanks, Lana! Thank you, Christin! I hope you have a great weekend, as well. Oh how I love Brownie Brittle. And these petit fours would make amazing holiday hostess gifts! You’re so right! I should have thought of that! Thanks, Melanie. These look awesome and addicting! I love the orange and chocolate combo. Yummy! Thanks – it’s a great combo!! Such a great idea. I love these for the holidays and for serving at a party. You’re right – perfect for the holidays! 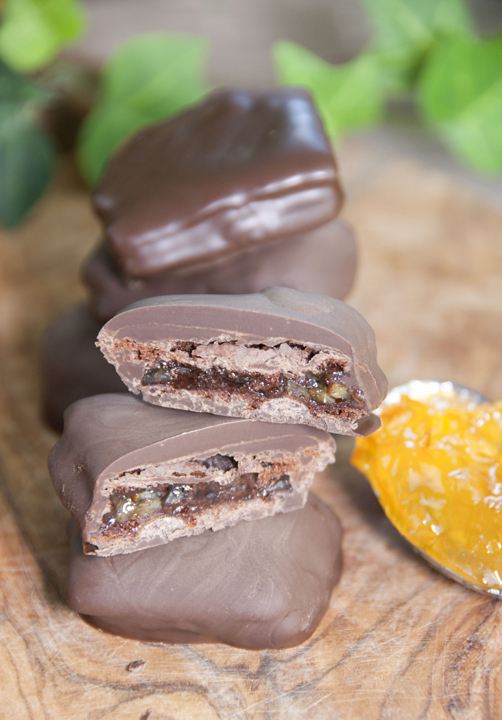 The combination of chocolate and orange sounds simply divine. I must see if I can find dairyfree brittle. It’s a great flavor combination for sure!! Thanks, Bes! I think I’m going to try these with my clementine marmalade! That’s a great idea! I should have written you can use any marmalade flavor! Ashley these look absolutely delicious and would be dangerous to have in my house as I would be tempted to eat them all! I bet they are addictive! Oh they sure are! Thanks, girl! These look absolutely delightful! I bet that pop of orange is fantastic! I don’t use the orange / chocolate combo enough – these look awesome! Your end product looks like something in an expensive candy store. Well down. Champion idea to use marmalade. Something a little different albeit orange and chocolate do have a warm and fuzzy history with each other. LOVE Brownie Brittle!! This is SO creative…Want!! Thank you for your nice comment, Colleen! I love the orange-chocolate combo! This sounds absolutely delicious!! This is such a smart idea! I love the mix of ‘brittle’ and chewy. What a fun take on petit fours! These look delicious!